“Speech” refers to the way we pronounce the sounds in words. Children learn to say specific sounds at different ages, so it’s common for them to make mistakes in the way they pronounce words. As children get older, their speech gradually becomes clearer and easier to understand. A speech delay is when a child continues to make a speech sound error past the age by which that sound usually develops. What might a speech delay sound like? What causes a speech del ay? Usually the cause of a speech delay is unknown. Often it’s simply that for whatever reason a child has difficulty producing a sound and needs specific instruction in how to say it. Alternatively, they are able to produce a sound but have learnt an incorrect pattern of using that sound when they talk. Children with speech sound difficulties are NOT being lazy. As far as they’re aware they are saying the word correctly; they usually don’t notice any difference in the way they say words compared with other people. Ear infections are common in children, especially from birth to about 6 years of age. Ear infections can interfere with how well a child is able to hear and this may impact on their speech sound development. It’s very important to have your child’s hearing assessed, particularly if they have a history of recurrent ear infections. If your child has difficulty saying sounds correctly, the best thing you can do is provide good models of that sound to them. This simply means that your child is able to hear you saying the sounds correctly, even if they don’t say it the same way. For example, if your child said “Mummy, I saw a pish in the pond” you might say “Oh, you saw a fish? Wow!” This tends to be more helpful than trying to get your child to repeat the word back correctly. As mentioned earlier, children are not generally aware of any difference between how they say the word and how you say it, so they might find it confusing if you ask them to say “Fish” again. Concerned? Click here to find out at what ages different sounds develop. If you are concerned about your child’s speech, contact SmallTalk Speech & Language Therapy to book an assessment. 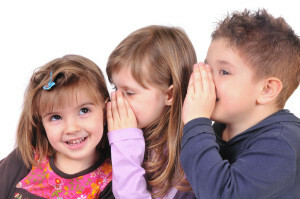 The speech pathologist will use pictures and games in order to hear the way your child pronounces certain words. This will allow them to analyse the way in which your child has learnt to say and use all the sounds we use in English. They will then give you feedback about which sounds your child is using and whether this is typical for their age. Together, you will decide with the speech pathologist whether speech therapy would be appropriate for your child or not.